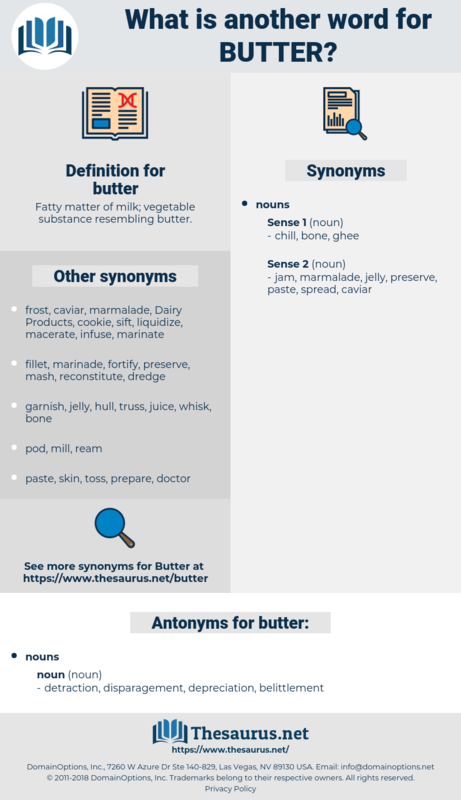 What is another word for butter? Fatty matter of milk; vegetable substance resembling butter. 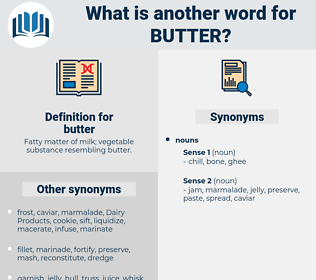 Thus, in some states there is a dairy commissioner whose duty it is to see that no substance is offered for sale as butter which is not butter. There was an air about them both which said: " You are not to try to get into conversation with us; we shall not let you if you do; we dare say you are very good sort of people, but we have nothing in common; so long as you keep quiet we will not hurt you; but if you so much as ask us to pass the melted butter we will shoot you." Beurre Noisette, stick, lemon butter, drawn butter, brown butter, Meuniere Butter, yak butter, clarified butter. food, dairy product, solid food. belligerent, fighter, scrapper, combatant, battler.